Accumulated type of field on Scriptcase is used to show a sum of a specific field based in the number of records loaded in a report application, it will show the total amount of all records already loaded on the applications, for example, in the image below Scriptcase will show the SUM of the credit limit field from the previous records and show it on the Accumulated field created by the developer. Click on this LINK to see the example running. In this example, we will develop a report using the accumulated field option, which allows accumulating the values of a column in another one. 1. Create a new grid application using the Customers table. 2. 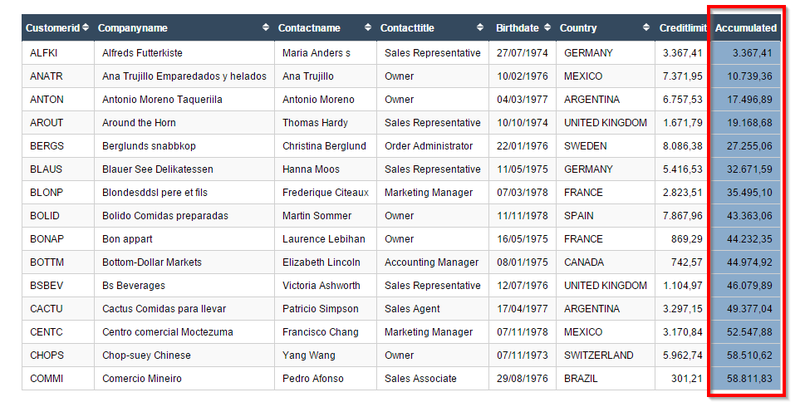 Select the fields CustomerID, CompanyName, ContactName, ContactTitle, BirthDate, Country and CreditLimit. 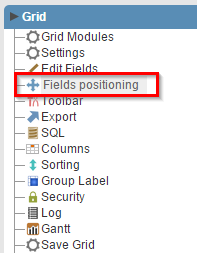 To select the fields click on Fields Positioning located in the application menu. 4. We will create one field called “Accumulated” of the “decimal” type. 5. In the settings of the field, use the “Accumulated” option and select the field “CreditLimit” in “Accumulator Field”. Do you want to see more Scriptcase examples? Click HERE to check it out.